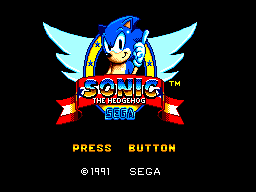 Sonic The Hedgehog on the SEGA Master System (SMS) is the version of the original Sonic game that's often overlooked. Being on the SMS, it went largely unnoticed by a big percentage of gamers in 1991 as they'd already moved on to the Mega Drive to play the definitive version of the game. Despite this, Sonic SMS is a great game with a challenging disposition. It's bright, colourful, and the sound track is also catchy and enjoyable. 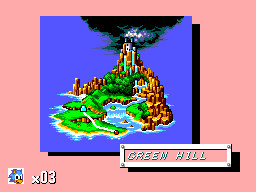 Considering that it only has three levels (zones) themes from the Mega Drive version- Green Hill, Labyrinth and Scrap Brain Zone, it's very difficult to call this a 'version' at all, more so an entirely original game considering that the levels that are shared between games have completely different level layouts and features. The premise is the same as the other games- Sonic runs, jumps and spins through an assortment of zones destroying enemy robots (badniks) and collecting rings. As usual there's a 10 minute timer in each zone, and every now and then for your troubles you'll be bounced in to a special stage to gain extra lives and continues, and you'll also face a boss after every themed area. Though it sounds the usual affair, there are a few differences in this game. Sonic can't pick up rings after they're lost and the collectible Chaos Emeralds are actually hidden within the stages themselves, meaning that you've got to hunt through the game for hidden paths and areas. Luckily, this doesn't detract from the usual run & jump play style, because the emeralds are never far away and are cleverly hidden through the course of the level. Metroid this ain't! The levels (or zones) themselves are unique, and each one has its own traps and enemies to look out for. To add a bit of variety, a few levels have features like screen locking and auto-scrolling, so you're never left to walk at a snail's pace. This game makes you work for your reward. The bosses are slightly more difficult than the Mega Drive game and each has their own pattern to figure out before you're able to land a hit on them. Some of them have varying attack patterns meaning that sometimes when you think you've jumped to attack, you end up jumping right in to a projectile. The game has a medium to hard difficulty, and the difficulty progresses as the game does. It starts off relatively easy in Green Hill Zone and by the third zone- Jungle Zone, you're introduced to a faster play style with less room for error. This doesn't last, as you beat the boss only to be thrown back literally in to the deep end with Labyrinth Zone, which is very similar to its Mega Drive counterpart, albeit with a very different layout entirely with more difficulty to grab bubbles. The later levels then pick the pace back up and introduce more environmental elements to impede and kill you. The final zone gets even more frantic, though I won't spoil it for you because this zone is exclusive to the SMS version. The graphics aren't the very best that the system has to offer but they get the job done. Everything moves smoothly and the Master System's colour palette is used quite effectively so everything is bright and cheerful. There's nothing that looks out of place considering the art style of Sonic was build for a stronger system. The soundtrack is catchy and memorable, and captures the feel of each environment well. The sound effects are also well done and the jumping and braking sounds are identical to the Mega Drive counterpart, bizarrely something every other Sonic SMS game fails to recreate. The rest of the sound effects are basic bops and blips which whilst they aren't absolutely mind blowing they do match the on-screen actions and they do the job well. 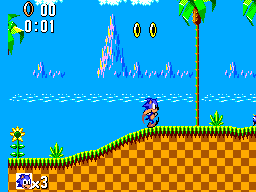 Despite the fact that Sonic was designed based on the merits of the Mega Drive, Sonic SMS does a great job of emulating the controls and physics of the 16-bit version. Though there's times when you'll be frustrated because the game often throws situations at you where there's much less time or room to jump than other Sonic games, if you do die it's always your fault because the game controls so well. There are one or two blind jumps and moments where the level design could have been tweaked to stop you running in to the abyss, but overall it does a good job of giving you control. Though it's a hard game, if you even put an ounce of effort in whilst playing you're bound to get enough lives to keep you going. Sonic The Hedgehog SMS has enough unique content in it to play through if you've already played the other games and it has the same level of replayability you've come to expect from the Sonic franchise, if not more. There's a top score of 500,000 obtained by completing all of the game's hidden objectives: Collecting all 6 Chaos Emeralds, all 12 life monitors, playing and completing all 8 bonus stages and not losing a life. Even if you don't finish them all, you'll still get the good ending if you collect all 6 Chaos Emeralds, so you'll still feel good about yourself. The ending and the credits are especially simplistically retro and should remind you why you play games in the first place. I can't recommend this game enough. Though it's certainly not perfect and I much prefer the Mega Drive game, it's enough to keep any one busy for a few hours at least. Once you get in, it's an addictive experience and getting to know the zones layouts and features through play is what makes this game worth coming back for to beat your previous play through and scores. If you have a Master System, a Master System Converter or a Wii Shop account, buy it. You may have to adjust to its simpler 8-bit style, but once you do you'll be hooked. A must own for anyone who likes 8-bit games, or platformers, or Sonic, or who owns a Master System, or all four.